My good friend Krista does not cook over the Christmas break. She does all her baking and then she just slices a ham or turkey breast for sandwiches. I have decided to pick up part of her philosophy of no cooking during the holidays and make life easy. My family loves hors d’ oeuvres and so I baked a ham yesterday, sliced it for sandwiches, baked some rolls, and each day I am making a new hors d’ oeuvres. One year we ate so much Ramaki that we can’t eat it anymore so I have researching some good recipes. I found one for artichoke dip that I tweaked a little. Preheat oven to 350 degrees F. In a large mixing bowl, beat the cream cheese with a hand held electric mixer until smooth. Then beat in the mayonnaise until smooth. Add remaining ingredients and stir together until combined. Transfer the dip to a pie plate or shallow gratin dish. Bake in a preheated oven for 30 to 40 minutes until the top is golden brown and the dip is bubbling. Serve hot with crackers or bread. that sounds so good! I have never thought about putting green chilies in the dip – yum. I love appetizers too – more than just a full meal. oh yum! i would love some of that right now – it sounds so delicious. It’s a little different than the one we usually make. thanks for sharing the recipe. Hmmm….you may be on to something. I love to snack and I never enjoy eating the big meal that I feel compelled to cook when I’m the one cooking it. Next year I may try the no cooking approach. 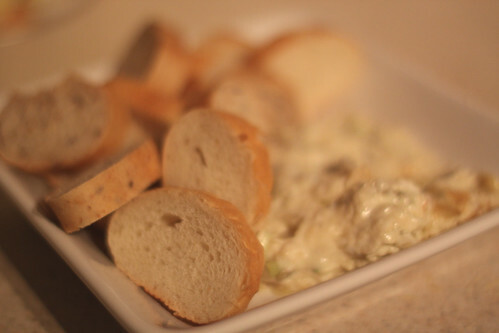 i looooooooooooooove artichoke dip…i’d like some now. Oh I love this idea and it’s going to work very nicely for Christmas 2009. The dip sounds delish & I can’t wait to try it. I love hors d’ouevres, too. The green chilies in the dip sounds really good. Happy not cooking!